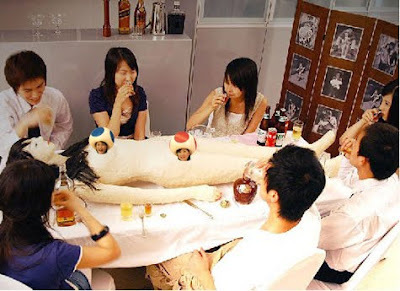 Apparently there's a restaurant in Japan that serves up full sized recreations of dead bodies. The entire body is edible; if you're in the mood for internal organs, you can cut them out and the body will actually bleed. I guess I can't really judge Japan on this one, it's sort of like the pinatas that we have at children's parties. 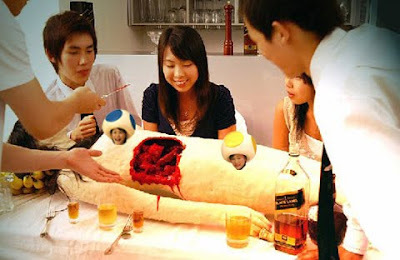 This is just a super realistic, bleeding, meat pinata... perfectly normal. What flavors do they offer and is there a vegetarian option?!? No. I think we can still judge Japan on this one. you mean the SEVERAL giant bottles of booze? what is the hair madeup of? Do they have any other races to consume? I'm in the mooood for mexican! What are the bodies and blood and internal organs made of? Cuz it might be quite delicious. Mexican... yum! This is the type of WTFery that is considered distasteful in Japan as well. The beer in the first picture is HITE beer, which is a Korean brand of beer. It is rarely sold or consumed in Japan. THIS PICTURE IS NOT JAPANESE. Judging from the beer, it's probably Korean. I doubt that these pictures are real. The situation seems extremely unrealistic, like the set up of the table with only one set of silverware on the table, no plates, etc. It doesn't look like anyone is really going to start eating on that table. The pictures are probably just a joke that people on the internet are unfortunately taking seriously. I feel guilty It kinda looks cool! This makes me think of this music video back from the '80s or early '90s by I don't know. All I remember was an Alice in Wonderland setting and some lady's a cake, and they're eating her. Music video was Tom Petty. It is not Japanese one. LOL wow the people in the pictures dont even look korean! 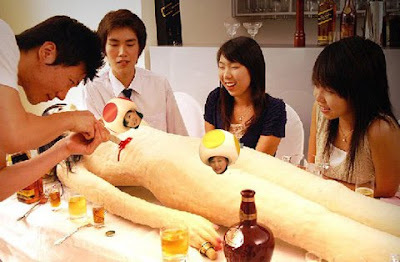 there japanese, the body isn't even real. Its prob from those crazy japanese horror films.